Haq's Musings: Sykes Picot Centenary: Did the West Sow the Seeds of ISIS? Sykes Picot Centenary: Did the West Sow the Seeds of ISIS? The Middle East continues to threaten global peace a century after British and French representatives, Sir Mark Sykes and Francois Georges Picot, signed the Sykes-Picot agreement named after them. This accord, concluded on May 19, 1916, divided the region extending from the Persian Gulf to the Mediterranean between the two colonial powers. Following the fall of the Ottoman Empire after the first World War, the British and the French colonial masters created a variety of states whose borders were drawn with little regard for ethnic, tribal, religious or linguistic considerations. Today, Daish (ISIS) militants are erasing the border between Iraq and Syria and pushing to get rid of all the region's frontiers created by Sykes-Picot. It is ironic that the Kurdish foes of ISIS share the goal of dismantling the borders that divide ethnic Kurds into several nations today. The West's actions since Sykes-Picot have further exacerbated the wounds inflicted on the peoples of the region during the European Colonial rule of the Middle East. Examples include the CIA-supported restoration of the Shah of Iran to power, the creation and the unconditional support of the State of Israel, the Suez crisis and the US invasions of Iraq. In an interview with Vice News, President Barack H. Obama acknowledged that the rise of ISIS was directly linked to the 2002 American invasion and occupation of Iraq during President George W. Bush's administration. In an earlier testimony to the US Congress, former Secretary of State Hillary Clinton said very candidly that "the terrorists we are fighting today we funded 20 years ago". 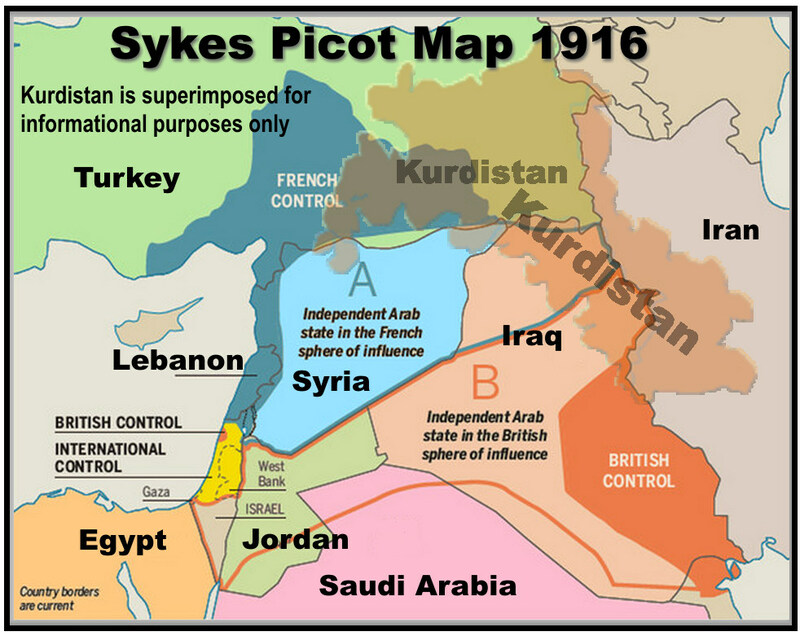 I hope the Sykes-Picot centenary causes the West, particularly the United States as its leader, to introspect about the West's actions in the Middle East in the past and the dangerous consequences of such actions we together face today. I hope the leaders of the West will ponder the unintended consequences before starting more wars in the region. So why don't these neighboring Arab countries sign a treaty between themselves to adjust (or erase) the colonial borders as an expression of their brotherly love and affection, as they see fit, to erase such an atrocious and historic injustice inflicted upon them? Ali: "So why don't these neighboring Arab countries sign a treaty between themselves to adjust (or erase) the colonial borders as an expression of their brotherly love and affection, as they see fit, to erase such an atrocious and historic injustice inflicted upon them?" Their leaders can't, or they won't for their own se;fish reasons. So ISIS is doing it for them using its own brutal tactics. And the Kurds share the goal of dismantling these borders. Why Belgium and Switzerland are peaceful ? Why Germans and French are not fighting in these states ? What If the West has given a state to Alwites in Syria or a State to Maronite Christians in Lebanon or a State to Coptic Christians in Egypt or a State to Assyrian Christians in Syria ? Was giving a state to Jews a right decision ? What if the West had divided Iraq into Shia and Sunni states ? What if Saudi Arabia was divided into Wahabi , Shia and Ismaeli states ? What if Yemen was divided into Zaydis and Sunnis ? Liberal: "Why Belgium and Switzerland are peaceful ? Why Germans and French are not fighting in these states ?" Europe has had more wars along ethnic and sectarian lines than any other continent in the history of the world. They are tired of war now. They have seen the futility of war. I agree totally with your analysis, but I am wondering whether there is another factor that the world powers are overlooking. The Euphrates/Tigris river system ranks among the most well-known on the planet. However, with an average annual flow of about 900 m3/seconds, it is relatively small when compared to other “famous” rivers such as the Amazon (209,000 m3/s), Orinoco (33,000 m3/s), Congo (41,000 m3/s), Danube (6,500 m3/s), Ganges (12,015 m3/s), Indus (6,600 m3/s), Mekong (16,000 m3/s), and Mississippi (12,743 m3/s). The combined population of Turkey (78,000,000), Syria (23,000,000), and Iraq (32,000,000) is 133,000,000. Thus we have a situation where three countries with a combined population about two thirds (66%) that of Pakistan are wholly or partially dependent on a river system with a flow that is only 14% that of the Indus. The population competes for a resource that supplies energy (hydroelectricity), food (irrigation), and industrial and domestic water supply. Turkey’s Southeastern Anatolia Project (GAP) is a reality. Large storage projects upstream from Syria and Iraq are of magnitudes that are almost inconceivable. The volumes of water currently intercepted and stored upstream in Turkey have a total volume of at least 109 km3 (Turkey/Euphrates, 92 km3 and Turkey/Tigris, 17 km3). This volume is equivalent to about three and a half years’ average annual flow for the Euphrates/Tigris river system. Theoretically, stored water for hydropower can be beneficial and provide downstream benefits when released during the dry season. However, the reality is that water is being diverted (in Turkey) to irrigate crops such as cotton. Flow rates into Syria and Iraq have already dropped. The Euphrates/Tigris headwaters have been going through – and no doubt always will go through – a block of very dry years since 2008. Given that 90% of Syria’s and Iraq’s water requirements are for irrigation, this series of dry years has severely impacted their food supply. Is this environmental disaster another factor in the current state of affairs? Steve: "Is this environmental disaster another factor in the current state of affairs?" I agree that there are many more issues in the region, including resource sharing issues. But I think the issues of identity and the fact that the borders were imposed by colonial powers, unlike those in Europe that were mutually agreed, are major causes of strife. BTW, India is currently suffering from severe drought in eastern and southern parts of the country. It's embarking on major diversion of water from the northern rivers of Brahmaputa and Ganges to address it. The biggest victim of this project will be Bangladesh which does not have any treaty with India along the lines of the internationally-brokered and monitored Indus Basin Water Treaty with Pakistan. The river-linking project could lead to further disputes not just between states, but with the neighbouring government of Bangladesh. India’s plans will affect 100 million people in Bangladesh, who live downstream of the Ganges and Brahmaputra and rely on the rivers for their livelihoods. On Monday, Bangladesh’s minister of water, Nazrul Islam, urged the Indian government to take Bangladesh’s water needs into consideration noting that 54 of 56 Indian rivers flowed through the country. India itself is screwed by China as it holds the upstream river of Brahamputra. The 3 gorges dam will divert lot of water from downstream countries. As usual Pak and BD will not say anything. India should also divert all rivers in kashmir. The British used to think of the region that roughly corresponds to today's Middle East as two entities: the Near East (the Balkans and the eastern Mediterranean) and the Middle East (the region around Iran and the Persian Gulf). By Nick Danforth, based on A. Keith Johnston's 1852 "Chart of the World Showing the Forms and Directions of the Ocean Currents." During the 19th century, the British mentally divided what most of the world now considers the Middle East into the Near East (the Balkans and the eastern Mediterranean) and the Middle East (the region around Iran and the Persian Gulf). There was a certain geographic and strategic logic to this division. The Near East was, well, nearer than the Middle East, and the Middle East was in the middle of the Near and Far Easts. For British colonial administrators, the Middle East was the region that was crucial to the defense of India, while the Near East was largely under the control of the Ottoman Empire. or several decades, the new usage remained confined to obscure branches of the British government. But, as this chart shows, it spread to the broader English-speaking public during World War II, when people suddenly started reading daily news reports about military developments in the area. Then, when Americans took a newfound interest in the region with the advent of the Cold War, they adopted the then-prevalent British term for it. Some have suggested that the term “Middle East” is problematic because it is, undeniably, a Western term reflecting a Western perspective. India’s first prime minister, Jawaharlal Nehru, once observed that the region should really be called West Asia, and there have been occasional efforts to adopt terms like “Southwest Asia” in academic circles. Yet there are plenty of countries whose names imply a relative geography that we hardly notice — Norway (north) and Austria (east), for example. And Arabic speakers have long referred to North Africa as the Maghreb — from a word meaning west — because it is on the western side of the Arabic-speaking world. Other events of the year included in the cables are papers on the Irish Republican Army (IRA), who in 1979 killed Lord Mountbatten, cousin of Britain’s Queen Elizabeth, and the Iranian hostage crisis, which saw 66 Americans taken hostage after 3,000 Iranian students raided the US embassy in Tehran. Mr Assange added: "In 1979 it seemed as if the blood would never stop. "Dozens of countries saw assassinations, coups, revolts, bombings, political kidnappings and wars of liberation." The Carter Cables III bring WikiLeaks' total published US diplomatic cable collection to 3.3 million documents.